China showers money, free trips on Barbados journalists and government employees. Where’s mine? That sound you hear at Chinese embassies throughout the Caribbean is the shuffling of journalists, government officials and other folks crawling on their knees to get their share of the free trips, goods, money and other largesse dispensed by the Chinese government because… because of their good and kind intentions. The only condition (and it’s not even necessary to agree in writing) is that the receiving governments, people and organisations don’t mention the sins of China or the Chinese Communist Party, including running the world’s largest slave camp system, systemic poisoning of the environment and the routine trampling of human rights, freedom of religion etc.. Also on the ‘don’t mention’ list are forced abortions and executions for property crimes to facilitate government selling of prisoners’ organs. And China certainly doesn’t want to hear any talk of the Tienanmen Square Massacre or how journalists are beaten to death for reporting illegal disposal of cadmium waste. Same same for the concerns over the Confucius Institute programme at UWI. So pay no attention to these fanciful stories of Chinese slave camps, forced abortions and repression of Christian. Just line up for the free money! What would Sarah Ann Gill think about our silence over religious persecution in China? The new Bajan export commodity: Wives to China! BFP Aug 14, 2008 – Hartley Henry Pays The Chinese Back For That Free Trip! Some 19 persons will be heading to the People’s Republic of China later this month to attend a number of bilateral seminars on Agro-processing and Agriculture. The group is scheduled to leave the island next Wednesday, June 10, 2015 for the seminars, which will run from Friday, June 12, to Thursday, July 2, on Hainan Island, China. The delegation will be led by Senior Agricultural Officer, Leslie Brereton, and will include representatives from the Barbados Investment Development Corporation (BIDC), the Barbados Agricultural Development and Marketing Corporation (BADMC), and a number of private persons involved in agriculture. Long-time readers of Barbados Free Press will remember that our founding editor Marcus (passed in 2013 and greatly missed) had a special place in his heart for the millions of Christians and others imprisoned as slaves in modern China’s Laogai slave camps. Marcus also wrote about the horrific forced abortions where Chinese mothers are kidnapped off the street, and held down while their babies are ripped from their wombs and killed. All at the direction of the Chinese Communist government. “In Communist China, the authorities kidnap pregnant women from the street, hold them down and abort their babies. That is the government were talking about. The same government that has been showering gifts and financial aid upon Barbados in order to win our votes at the United Nations. June 28, 2006: Slave Labour Camps “Vital Part of Chinese Economy” – Should Barbados Take Gifts From Communist China? On August 14, Chinese Ambassador Xu Hong met with Colonel Quintyne, Chief of Staff of the Barbados Defence Force (BDF). They exchanged views on how to deepen bilateral relations with a focus on cooperation between Chinese People’s Liberation Army and Barbados Defence Force. Colonel Quintyne extended his gratitude to the Chinese side for the technical support and personnel training provided to the BDF. He pointed out that in recent years, the military cooperation between Barbados and China developed smoothly with fruitful progress. He hoped to strengthen the cooperation and exchange between the two militaries thus deepening the friendship between Barbados and China. Ambassador Xu spoke highly of the effort made by the BDF to promote bilateral military cooperation. He expressed the willingness to work together with Barbadian side to further widening the scope of military cooperation with the aim of raising bilateral relations to a new level. Slave Labour Camps “Vital Part of Chinese Economy” – Should Barbados Take Gifts From Communist China? There is no doubt that the Chinese press will cover the appearance of the Chief Justice just as they covered and propagandized the participation of SIR David at the time he was Chief Justice. The appearance of members of the Judiciary and police officers from other countries is regularly publicized in China to enhance the sorry image of the Chinese judiciary with the masses. The festivities were held in Bridgetown on Wednesday night to mark the 63rd Anniversary of the founding of the People’s Republic of China when Mao and his gang took over, seized all privately held lands, businesses and assets and started the world’s largest slaughter of peasants and anyone else who disagreed with the communists. During the 1950s, the ChiComs established the world’s largest slave camp system where entire families of Christians, business people and other dissidents were imprisoned and forced to work for the state. China still maintains this slave camp system where Christians and others now make consumer products including soccer balls and auto parts for China’s economy. The arbitrary theft of land by the communists still goes on, and that leads us to the horrific story of He Zhi Hua – a Changsha villager who was forcibly evicted from his home so the land could be given to local business interests closely tied to the communist government officials. 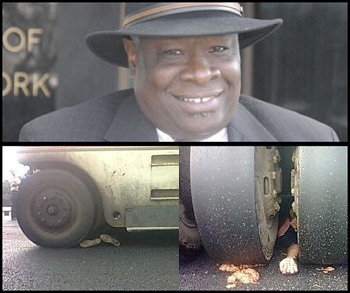 He Zhi Hua laid down on the road in protest to prevent the construction equipment from moving in. What exactly does Barbados hope to learn from China about managing the environment? If you’re going to speak, at least speak the truth – better to just keep silent than to perpetuate a lie. At least that’s what I was always taught. In recent years China has seen mass riots and violent government responses when the citizen-slaves stand up to stop the ongoing slaughter of humanity caused by their government’s callous and long term disregard for people and the environment. All those low priced Chinese goods you purchase are low priced for a number of reasons: government & private slave labour camps, sweatshops, rampant pollution and the communist disdain for individual human rights and human life. Did they care that slaves suffered to provide the products at a certain price? Disposable people feed China’s industrial machine. This man paid the price for low-priced Chinese goods in Barbados. Babies explain why Chinese-made products are so cheap. 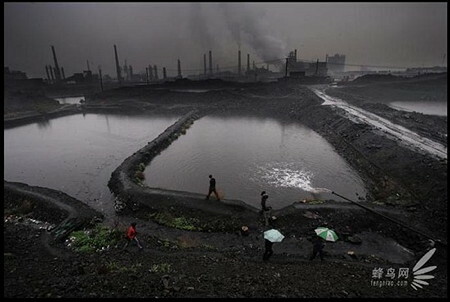 For unbelievable photos of living conditions and pollution in China, check out China Hush Amazing Pictures, Pollution in China. I just can’t bring myself to post the photos of the children online. If you must, go to Google and search for photos of “shanxi china pollution birth defects”. It doesn’t much matter whether the “SafeSearch” is on or off: Send the children out of the room first. To The Nation, Barbados Advocate, Barbados Today: How much of your content is paid for by China? As part of its efforts to influence global opinion about China, the Chinese Communist Party (CCP) gives hard-to-resist treats to media workers in the Caribbean. In exchange for its generosity, the CCP hopes to get coverage of China in line with its propaganda. Since around 2007, journalists and editors from these small island nations are fêted with official tours to China where they are greeted and banqueted, given tours and lectures, and patiently educated on the “peculiar characteristics” of modern China’s political and social system.